After our client completed a successful drilling program, which evolved into a major new hybrid resource play with significant reserve and production upside, OEL Projects Ltd. (OEL) was commissioned to complete both an initial primary facility installation, as well as a major expansion to their existing Sour Gas Plant. 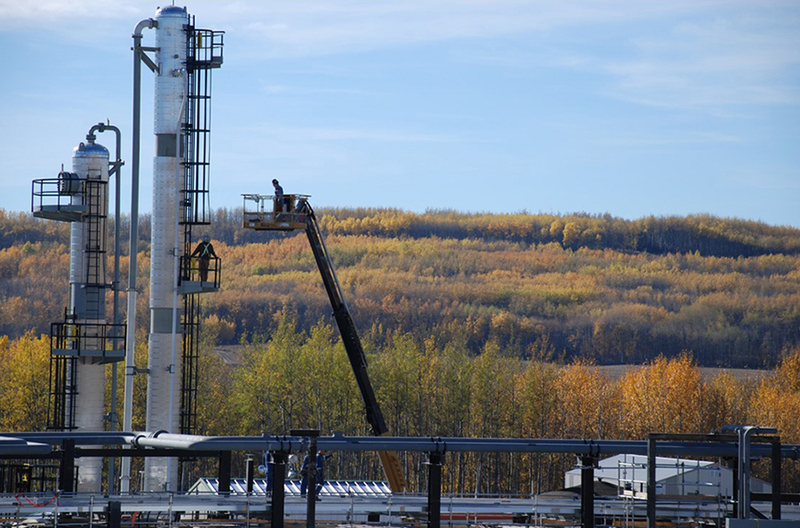 Located in the Spirit River area/Charlie Lake formation in North Western Alberta, the major construction of the Spirit River Sour Gas Plant was completed in two phases, doubling capacity of the plant. The project involved the front-end engineering and design (FEED) and engineering, design, construction management and procurement to expand the facility to process 1,700 e3m3/day (60MMSCFD) of sour natural gas, and 220m3/ day (1,370 bbls/day) of hydrocarbon liquids. This consisted of a wide variety of process and accounting meters throughout the facility for gas and liquid service. OEL bid the construction elements on a per diameter inch and per pound basis, this brought time and cost savings efficiencies into the project and integrated the construction team during the early project phases. A very space efficient equipment layout was designed due to a relatively small initial lease space and physical access limitations. Several innovative construction practices were implemented including; offsite fabrication of approximately 95% of the piping and structural materials, utilizing scaffolding to allow mechanical and electrical workers to effectively and safely work on the massive pipe-rack structure simultaneously and the setting of major equipment modules was timed to allow for final measurements for accurate pipe fabrication offsite and minimized onsite welding and rework. Due to over 6,000 horsepower of on-site compression, civil design included complex concrete pads, welded to piles for vibration reduction on rotating equipment. Regrading of the entire site was required to support the overall design scope for the plant. These challenges were met by a large-scale cut and fill technique with layered compaction to level the groundwork. With the successful startup and commissioning of this project, our client has exceeded their planned daily production exit volumes. The Spirit River Sour Gas Plant continues to produce gas for our client today and is one of OEL’s most successful and challenging projects. To find out how we can help you with your next project, call us toll free at 1-888-348-8991.